In a new caffè some way out of town, the team gathered to discuss the latest adventure. Skratch arrived late and paused at a wine barrel to beat a jolly tune with his paws. "Oh oh oh. What was that," he sang, "for a sort of adventure for a cat?" "I'll answer this time," said Wabsworth. "Do tell," smiled Lapinette. "It was modernist, yet anti realist," stated Wabsworth solemnly. Skratch had taken some time to warm to Wabsworth but he nodded his head approvingly. "Mmm, yes" said Skratch and then he grinned. "But I'm not anti realist as such," he said. "I just prefer a different realism." The Wabbit chipped in. "How many realisms are there anyway?" Lapinette pointed and counted round the group. "Four to start with!" 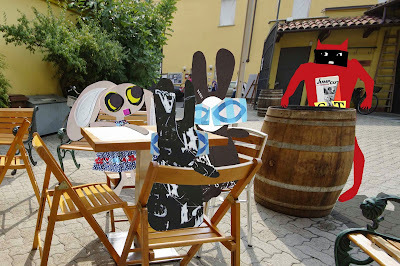 "I fear we're falling into the pit of relativism," said the Wabbit and nudged Lapinette under the table. "How deep is that?" asked Wabsworth. "River deep, mountain high!" said Skratch. Everyone laughed and laughed, but the Wabbit decided that frivolity had gone too far. "The service here is a little slow," he commented and now I'm thirsty." "I'll have a Cabiria," said Wabsworth. "It might be a while. I think the waiters have been kidnapped," said the Wabbit.